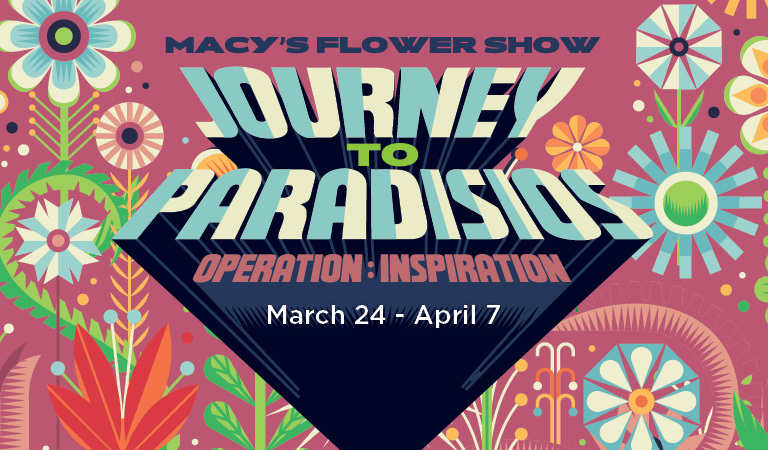 Every year Macy’s Herald Square transforms into a breathtaking floral wonderland to celebrate the Spring Season. Millions of guests visit the store during this two week period, to view breathtaking floral arrangements free of charge. While you stroll through the historic Macy’s Herald Square and revel in the thousands of budding blooms, you are bound to work up an appetite. Fortunately, you won’t have to go far to find great food. No matter your choice of cuisine - a nice sit-down meal with a view of the Empire State Building at Stella 34, a great burger and a craft beer at Rowland’s, or a quick pit-stop at the Chef Street food trucks parked in Macy’s One Below level, you will not be disappointed. Check out these menus and book a reservation today! Tables book quickly. Visit Stella 34 Trattoria on the 6th floor, celebrating this year’s space odyssey theme with a breathtaking floral display in the restaurant, specially crafted cocktails, and an exclusive Flower Show Prix-Fixe Menu featuring Executive Chef Jarett Appell’s playful seasonal expressions on classic Italian spring dishes, inspired by cosmic dreams and outer space. Stella 34 Trattoria is an Italian restaurant near Penn Station with Empire State Building views, serving lunch, dinner, brunch and drinks. Visit Rowland’s Bar & Grill on the Lower Level and experience a New Horizon, a stellar cocktail guaranteed to be out-of-this-world — for just $8 during the Flower Show. Visit Chef Street on the Lower Level during the Flower Show and receive free a Popcorn snack with any purchase of $5 or more. Limit one per guest per visit.